I’ve been absent from posting for a while as I prepared for my wedding (which just occurred on 2/16). I’m happy to share some of the designs I created as part of my wedding planning. My husband Paul and I share a video game hobby, so that was the theme of our reception. The first step was the invitations. We choose 13 games that were most memorable for us as a couple and included them on the front side of the invitations with descriptions of what they signified for us. Our wedding colors were purple and green, hence the color scheme of the invites. All characters are the copyright/trademark/property of their respective studios and game companies. 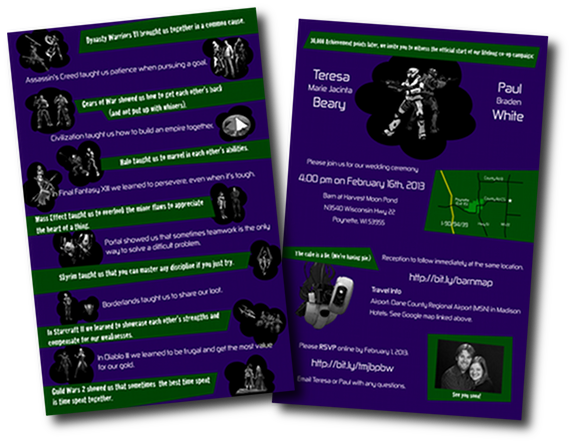 See the full-size front side and back side of the invitations. I promise to be your faithful co-op partner for life, in low level and high, whether noob or l33t, regardless of lag, downed servers, or loss of internet. I promise to celebrate your achievements as if they were my own and to openly share my loot with you. I swear to stand by you when your K/D spread is negative and to always help you achieve 100% map completion. I will not grow angry when your character is higher level than mine, because I know in time we will reach the level cap together. I will wait with you for the midnight release of the next summer blockbuster, no matter how long the line, and I promise to always pre-order a second copy of PC games so we can play the online co-op. I swear to never forsake you from my party, nor to quit in rage. From this day forward, my game library is yours, and together we’ll share one hard drive, on this game system, and on every system to come. 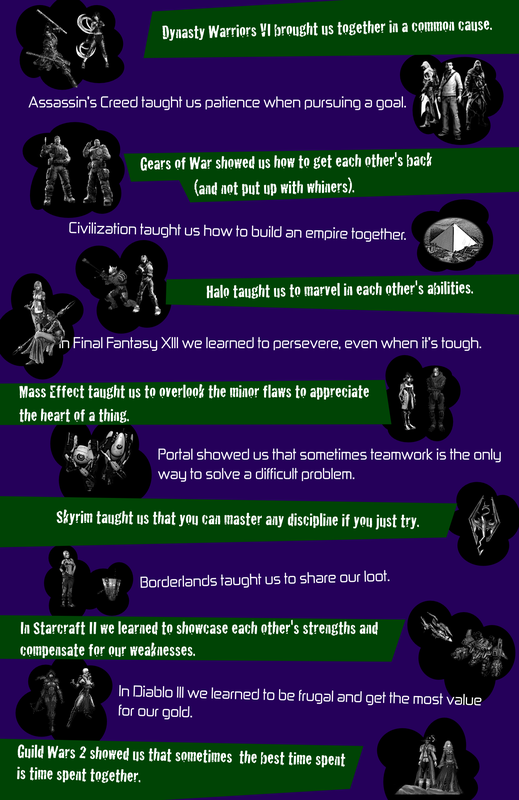 Our venue provided a digital projector for us to use free of charge, so I decided to create a PowerPoint presentation that gave some more background on us (the bride and groom) and explained the video game references in the invitations. I took out a few of the slides that mentioned personal details about us, but wanted to post the slides I made about each game. 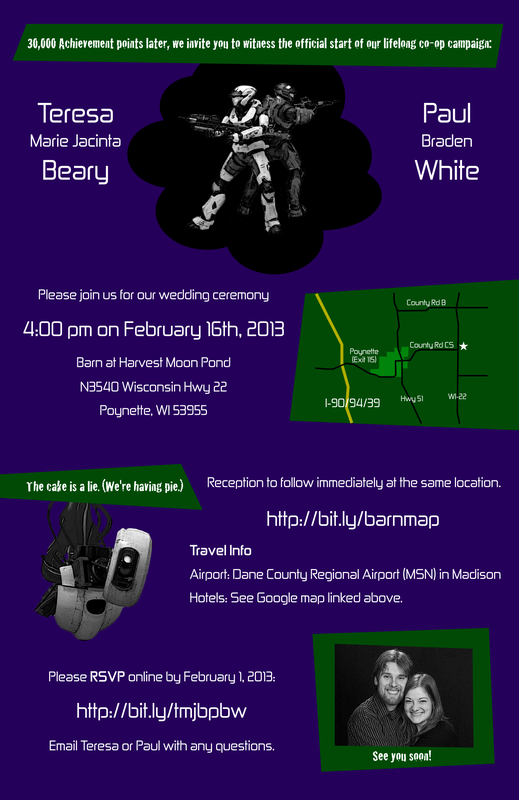 They include the same description from the invitation and then an explanation and cartoon image that I drew using autoshapes (except for the Terran and Protoss symbols which I found on elrondsmith‘s Deviant Art page). Reviewing my work, my favorite part is the documentary-style intro for each game and then the animations I made to accompany my autoshape art. Using PowerPoint 2010 I converted it to a video which you can watch below. For our table centerpieces we bought video game action figures and statues. My other brother, Morgan, created an amazing Halo set piece for us. Paul and I like to team up on a warthog in online multiplayer and usually rack up a pretty good score for our team in Big Team Slayer. The set piece has a warthog with spartan groom driving (complete with tux jacket) and spartan bride on the turret (with white lace skirt). He also added a just married sign and little tin cans hanging off the rear bumper. It was an amazing piece of art (he also made a Halo ring to hang above the ground scene, and there was EL wire included to make it all glow) and I can’t wait to get our photos back from our wedding photographer. Speaking of photos, I’ll do a follow-up post with images of the centerpiece, set piece, and possibly a video of us saying our gamer vows once we get all of those things. The photos will take 4-8 weeks, so don’t get overly excited yet. Thanks to everyone who made the trip up to Wisconsin to see us! We had a wonderful time and are lucky to have you all in our lives! Congratulations, Teresa! What a cool way to make your wedding unique and *yours*!